Each year my family breaks away from our busy urban lives to slow down amid the redwood groves of upper Big Sur. My first fish as a youngster was a tiny trout out of the Big Sur river. Sadly, the river no longer offers much in the way of fishing, not even for fingerling trout. But the ocean at Big Sur always seemed powerful, even threatening. Since I’ve been a child I’ve been confined to the shore, limited to watching treacherous waves smashing onto beaches and rocky headlands. As I prepared for this summer’s trip it slowly dawned on me that my kayak handling skills might be up to the challenging conditions of the Big Sur coast. Would it really be possible, I wondered, to kayak fish this precipitous, serrated shore? 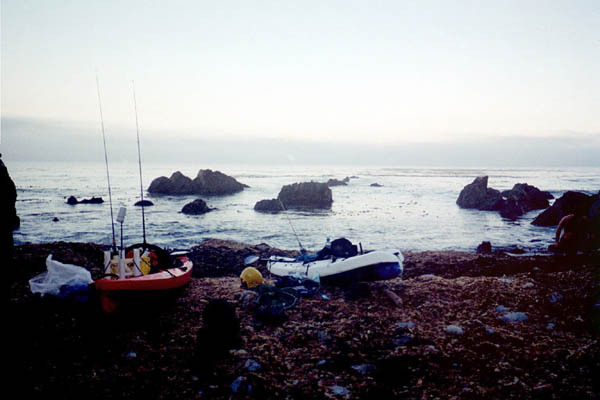 I started hunting the kayak fishing internet sites, looking for some local Big Sur knowledge. 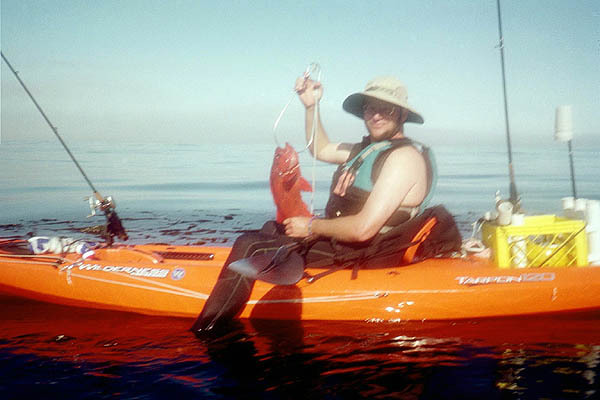 Jason of Kayak Sport Fishing suggested I contact Brendan Crahan, a kayak fisherman based in Santa Cruz. 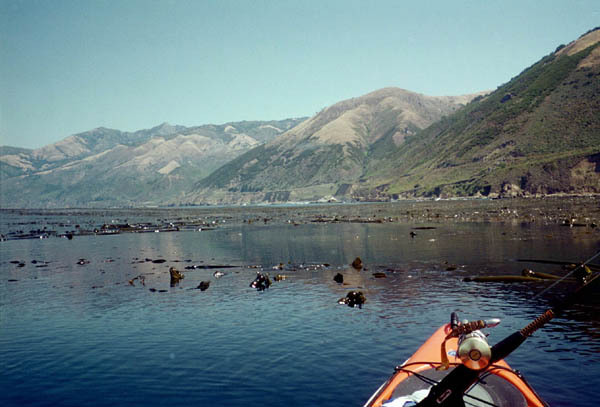 The recommendation came with a warning; if I wasn’t careful, Brendan would have me hiking miles with my fishing gear stuffed in a backpack, then descending soaring cliffs, all the while dragging a kayak, to reach some back of beyond launch site. Nothing about Brendan’s email correspondence suggested insanity, so I signed up for an experience sure to be an adventure to remember. Brendan’s first directive was for me to get some surf practice. How big, I asked. Oh, nothing much, just be prepared to launch and land through four to five foot surf, Brendan replied. Ahhh…… I determined to reduce the pucker factor through a crash program – I wiped out in larger than coddled La Jolla conditions until I no longer feared getting crushed in the surf zone. Almost by accident I improved my surf skills too. Next I collected the required gear. The long equipment list included necessities such as a full wetsuit, aerial flares, and a smoke canister. As I emptied my wallet on a new NRS suit, signaling equipment, and oh yeah, tackle, I wondered anew just what lay in store for me. No misgivings could prevent the excitement and anticipation from building as the trip drew near. Finally Brendan arrived in our camp at Pffiefer Big Sur State Park the night before our day on the water. He told me he had a special launch site in mind for me. One more remote and difficult to access than the “easy” ones. But the fishing promised to be other-worldly. Somehow I managed to get an hour or two of sleep, then was up before the alarm. We drove an hour south through the gloom of pre-dawn, then pulled off at a nondescript wide spot on the highway. The ocean lay somewhere to our right, beyond a wide coastal terrace. We lifted our kayaks and fishing gear over a cattle fence, propped our kayaks on wheels, and then headed downhill across a scrubby meadow. Some four or five hundred yards later we halted at the brink of a bluff overlooking the ocean. The next step was to carry the boats down a steep scree and boulder slope about thirty vertical feet to the bottom of a hidden cove, where we rigged up. As I looked out over the ocean from our tiny cove the thought came to me that I was peering out of a giant’s mouth, past teeth of rock spires; guarding our cove from the surf, or hemming us in? Luckily the ocean was placid, the wind and large surf absent. Brendan pointed a route through the maze of rocks and sent me off with a wave. I rode my own wave of exhilaration through the spires, around the toothsome rocks, and out onto the wild waters of Big Sur. A whoop of joy escaped me as I marveled at the surroundings. To shore, the dawn-lit and towering Ventana mountains plunged to the sea. Around me the ocean surged against a rough coastline. To sea stretched luxuriant kelp forests. If my day had ended then, without fishing, I would have been content. Brendan arrived, and we started out across the bull kelp. As our hulls scraped across the thick cables they thrummed like truck tires on a washboard road. We halted at the edge of the kelp in shallow water and dropped down our six inch Scampis. Shortly we had each pulled up nice rockfish, the start of a day of near non-stop action. Blue, olive, spotted, and other numerous types came to our kayaks. Fish that I would consider keepers in San Diego were released as too small to bother cleaning. Besides we had all day. As I peered down through the clear water I could sometimes see the fish striking at my lure. We moved from spot to spot seeking out the larger fish. At one point we paddled out to a distant, isolated boiler rock with a small adjacent patch of kelp. My lure was hammered and my pole bent over. After a spirited fight I boated my first of many lingcod, just short of legal. A tongue of fog capriciously moved between us and the shore, so we moved back in and fished the kelp potholes. After a change of lure colors I pulled up a startlingly red fish, a large vermillion rockfish and the first fish for my stringer. Next we paddled into the center of a large and thick kelp mat. We dropped our lures through the tiniest of openings, pulling up fish after fish. Once in a while I'd lose a big fish at landing, but it didn't matter, there was always another big one waiting for my bait. Almost unnoticed, time passed quickly in a haze Brendan called fishing euphoria. It was nearly time to head in. Reluctant to call it a day, Brendan suggested we search out an isolated kelp stringer in deeper water. I found one, maybe a floater, but dropped in anyway. Immediately we were into more big vermillions and lots of lingcod. As I broke off on one last fish I realized I was exhausted. Time to paddle back to shore. Each of us had saved a few big rockfish (only two reds each), enough for a generous family-size meal. I staged amidst the boilers and watched Brendan’s route back in through the maze of rocks. Seizing a window I sprinted in, landing dry. Just as I hauled up my kayak the surf picked up, as if it had waited for us to land to return to its normal boisterousness. We cleaned our fish on the beach with a cutting board and filet knife Brendan had thoughtfully brought along. Next it was time to haul the kayaks up the bluff. I struggled my way up onto the coastal shelf, then haltingly trudged pushing my loaded kayak back up the hill to the road. It is true, I was gassed, but refused Brendan’s offer of help out of pride (I can carry my own weight!). Reluctantly I bid farewell to Brendan and headed back to camp. The glow of an incredible trip carried me throughout the next several days. Not until the next to last morning of our family trip did I have an opportunity to return to the water. I earned my solo Big Sur kayak fishing “wings,” this time trekking my gear down the bluff on my own. The surf and swell were up a bit, the fishing a bit tougher. The big lings eluded me, breaking me off in the rocks every time. Next time I might break out a bigger stick than the chunky Ugly Stick bass rod and Corsair 300 spooled with Cuda 12 pound line. When it was time to head in I had to wait out some dicey conditions – surf breaking in the entry to the little cove, and again right on the cobbly beach. A bit of patience brought a lull and again I landed dry. This time, with spare energy in the tank, the trip up the bluff and uphill back to the road wasn’t a struggle, even alone. Now I’m back at home, wishing I were still up at Big Sur. Brendan opened my eyes to the possibilities. Thorough preparation paired with the willingness to sweat to access an out of the way launch site gives the kayak angler opportunities that other fishermen can only envy. I highly recommend anyone headed to Big Sur contact Brendan Crahan for some local tips. 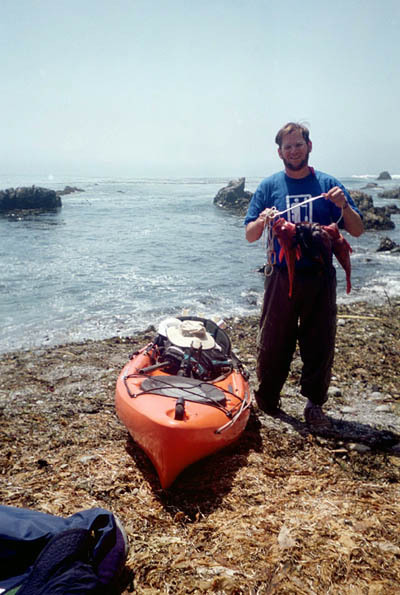 Brendan patiently answered all of my incessant questions, prepared me for and taught me how to assess the challenging conditions of Big Sur, and shared launch site information he has painstakingly gathered. 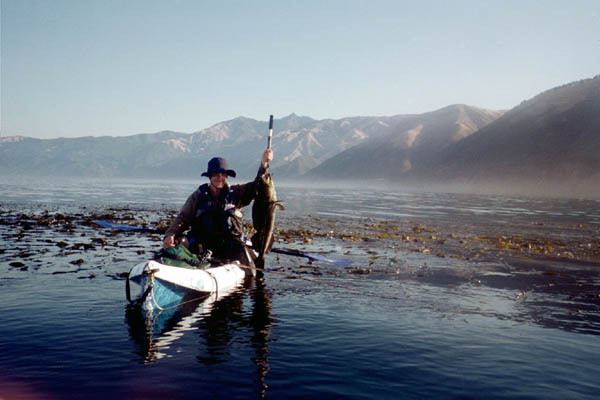 Now I can enjoy the bounties and beauties of kayak fishing the Big Sur coast on my own during future family trips. Beyond all this, Brendan is a great fishing companion. I caught fish until my arms ached. Maybe better, I experienced a unique side of Big Sur, from the water amidst a scenic cragged coastline. I’m smitten; Big Sur has my soul, and I must return. Let me know if you’re going and would enjoy some company.